In large part, this blog exists to inform individuals of all backgrounds about the risks that lead to abnormal health outcomes. Our hope is that once you discover the risks, you’ll be sufficiently equipped and incentivized to take the simple steps provided to improve your health. Disparities are abnormal outcomes of a different variety. Disparities in healthcare lead to premature development of disease and death. The culprits are often insufficient access to care, culture barriers, habits and even discriminatory practices. It is critical for all involved, i.e., individuals, healthcare planners and practitioners, to understand these causes so that everyone can adjust habits and apply resources to combat this health hazard affecting both individuals and communities. For the last 25 years of my career, I’ve had the unfortunate privilege of addressing this topic in national forums, including before the National Urban League, before the National Medical Association, recently, in the NAACP’s The Crisis magazine and in Straight, No Chaser to extent that our service provides you with the information that can make a difference in your lives. Unfortunately for some, it’s almost never that easy. As a statement of fact, according to the Center for Disease Control and Prevention (CDC) Health Disparities & Inequalities Report of 2013, African-Americans suffer global health disparities that result in the following outcomes. Life expectancy: In 2011, the average American could expect to live 78.7 years. The average African-American could only expect to live 75.3 years, compared with 78.8 years for the average White American. Death rates: In 2009, African-Americans had the highest death rates from homicide among all racial and ethnic populations. Rates among African-American males were the highest for males across all age groups. 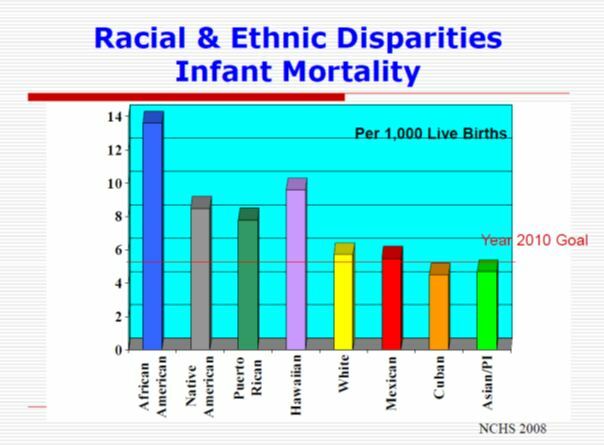 Infant mortality rates: In 2008, infants of African-American women had the highest death rate among American infants with a rate more than twice as high as infants of white women. Heart disease and stroke: In 2009, African-Americans had the largest death rates from heart disease and stroke compared with other racial and ethnic populations, with disparities across all age groups younger than 85 years of age. High blood pressure: From 2007-2010, the prevalence of hypertension was among adults aged 65 years and older, African-American adults, US-born adults, adults with less than a college education, adults who received public health insurance (18-64 years old) and those with diabetes, obesity or a disability compared with their counterparts. The percentages of African-Americans and Hispanics who had control of high blood pressure were lower compared to white adults. Obesity: From 2007-2010, the prevalence of obesity among adults was highest among African-American women compared with white and Mexican American women and men. Obesity prevalence among African-American adults was the largest compared to other race ethnicity groups. 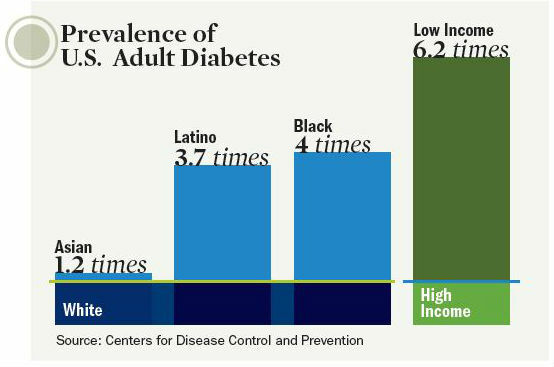 Diabetes: In 2010, the prevalence of diabetes among African-American adults was nearly twice as large as that for white adults. Activity limitations caused by chronic conditions: From 1999-2008, the number of years of expected life free of activity limitations caused by chronic conditions is disproportionately higher for African-American adults than whites. Periodontitis: In 2009-2010, the prevalence of periodontitis (a form of dental disease) was greatest among African-American and Mexican American adults compared with white adults. HIV: In 2010, African-American adults had the largest HIV infection rate compared with rates among other racial and ethnic populations. Prescribed HIV treatment among African-American adults living with HIV was less than among white adults. Access to care: In 2010, Hispanic and African-American adults aged 18-64 years had larger percentages without health insurance compared with white and Asian/Pacific Islander counterparts. Colorectal cancer: In 2008, African-Americans had the largest incidence and death rates from colorectal cancer of all racial and ethnic populations despite similar colorectal screening rates compared to white adults. Influenza vaccination: During the 2010-11 influenza season, influenza vaccination coverage was similar for African-American and white children aged six months to 17 years but lower among African-American adults compared with white adults. Socioeconomic factors: In 2011, similar to other minority adults aged 25 years or older, a larger percentage of African-American adults did not complete high school compared with white adults. A larger percentage of African-American adults also lived below the poverty level and were unemployed (adults aged 18-64 years) compared with white adults of the same age. Identifying disparities is a good start. However, to reduce them it is necessary to identify and implement solutions, both individually and institutionally. To this end, we will explore best practices in future Straight, No Chaser posts. Feel free to ask any questions you have on this topic.